Of the fruits of philosophers of modernity engaging with their penchant for cinephilia, the two books of Gilles Deleuze’s freewheeling ruminations on cinema are arguably of the most utility to the contemporary film scholar. Like the similar enthusiast theories of Benjamin, Kracauer and Žižek, there are myriad refreshing and extraordinary insights, original and from without the mainstream of institutionalised cinematic discourse. However this is accompanied by a degree of opacity, wherein continental logical convolutions fused with an anecdotal and digressive poetics combine to all but guarantee ambiguities and endless fodder for debates. In each commentary on these profuse works, there is a sense of yearning for Cinema 1 and 2 to hold a systematic key to understanding the various aspects of the cinematic image. The work’s now famous schema of the movement and time images also manages to make glancing use of the various modes of cinematic study up to the mid-eighties. It embraces auteurism unquestioningly while making use of various psychoanalytical perspectives without being slavish to them. Deleuze’s valuing and re-valuing of the primacy of the image appears to be a boon for the post-Bordwellian scholar pursuing evidence within the frame for their theories of the cinematic apparatus. But the French cult figure’s semantic slipperiness and sprawling sequence of ideas tends to embody the action-situation-action structure of a Hawksian movement-image plot. Consequently, Deleuze analysis and demystifying is a burgeoning field. Richard Rushton’s contribution to Continuum’s cross-disciplinary series ‘Deleuze Encounters’ is one of the most recent entries. Cinema After Deleuze is an engaging addition to the spate of works asking just what is so prescient about the broad and ultimately semi-historical divisions of the movement-image and the time-image. It is a compact overview, yet despite its brevity follows its source text in its rambling structure. Rushton follows a broad introductory commentary on Deleuze’s choices of referents in the Cinema books with an interesting application of the ideas to films produced subsequent to Deleuze’s death. Focusing on the ideological and narrative implications of Deleuze’s bifurcatory conceptions of the cinematic image, Rushton works hard to avoid the essential dichotomy seeming to be a too-tidy way of distinguishing empirically the categories of high art and low entertainment cinema yet the strain is evident. Forgoing the focus of commentators on the phenomenological implications of Deleuze’s conception of time and perception of the image derived from Bergson and Bazin, Richard Rushton instead focuses on the narratological implications of the movement/time image distinction. The role of memory and the separations of the past, present and future are emphasised to the extent that an implied ideological preference is imputed to the time image. The movement image is largely conflated with certainties and righting of wrongs, a presupposition “that the world can, if certain specific actions are performed, be brought to a right, proper and stable order” (4); while of the time-image Rushton suggests there is “in a sense…a certain inability to work out what the right and proper reposes to a problem are” (5). It is a conceptual prism in which Deleuze’s books appear to be purely to do with narrative conceptions of history and their role in supporting a cultural apparatus of action or inaction as regards the possibility of or need for change. It is an interestingly specific approach that, while certainly valid and present in Deleuze’s text, tends to elide the bulk of Deleuze cinema scholarship, as exempified by the ontological collection The Brain Is the Screen (ed. Flaxman, Minneapolis: 2000). As such it is perhaps a slight misdirect for a broad introductory overview intended for the relatively recent initiate. Rushton presents a picture of Deleuze’s famous fluid binary through a generally fascinating succession of potted, but detailed narrative analyses of particular directors and films. He begins by presenting distillations of Deleuze’s definitions of the image, the history of cinema and cinema’s role as spiritual automata, a thinking machine. Three chapters each focus on the movement-image and the time-image, each sub-group following a conveniently chronological sequence, although Rushton is at pains to emphasise the nebulous nature of the boundaries of these sets. The movement-image groupings are: the early silents of Griffith, Eisenstein, Gance and Lang; the fraught American myths of Ford and Kazan; and finally the action cinema of Hawks is conflated with the slippery case of Hitchcock. The time-image section begins with Italian neo-realism and ‘After’ (by which read Antonioni), the memory labyrinths of Ophuls and Fellini, and completes the symmetry with a similarly complicated coupling of Welles and Resnais. A pivotal chapter ‘Thought and Cinema’ deals with how Godard’s time images are exemplary in the way in which they “emphasise[.] the breakages between images” (109). Highly illuminating, this section holds a typically optimistic appraisal of the capacity for the time image to bring the spectator away from ideological templates of perception to a renewed ‘belief’ in the unmediated real world, especially seen in Godard’s fictional work of the 80’s onwards (114). The final pair of chapters fulfil at least the purely chronological promise of the book’s title and constitute what I feel is the work’s main justification. The movement-image and the time-image are respectively illustrated by films made after Deleuze’s death, yet illustrate consistencies and trends maintained before that arbitrary marker. In a way they constitute additions to the canon of directors that Deleuze felt important enough to refer to, in a poignant hypothetical. Rushton continues the pattern of contrasting directors with similar parallels to those selected from Deleuze’s canon. Spielberg and Scorsese are seen through their attitudes to the American Dream as contemporary counterparts to Ford/Kazan and Hawks respectively. The final third of this chapter deals with Besson, spectacle and pastiche, coining the new term ‘spectacle-image’. It is a section that only glancingly engages with Deleuze and appears to be an inserted lament for a golden era of popular film-making with a perceived greater depth than mere postmodern surface texture – “it is as though with Besson’s films ….the movement-image can barely believe in itself anymore” (138). Rushton’s roll call of contemporary practitioners of the time-image returns the book to the always simmering predilection for the art cinema image as a superior mode. Von Trier is appraised via his use of the time-image to erase boundaries between extremes of ethical standpoints, reinforcing the narratalogical implications of Deleuze’s ideas. The films of Wong Kar Wai are described repeatedly as “exemplary time-images” (146, 149) for their complex and poetic blurrings of past and present. Abbas Kiarostami’s cinema of extra-diegetics is praised for its extending the sub-category of the crystal-image into the “open image…the endings of which also open out the remainder of the film, reopen its pasts in the light of the open and unresolved presents of the endings” (154). Rushton’s analysis lacks a certain rigor at this point, conflating a listing of Wai and Kiarostami’s complexities with the simple aesthetic promotion of their work. 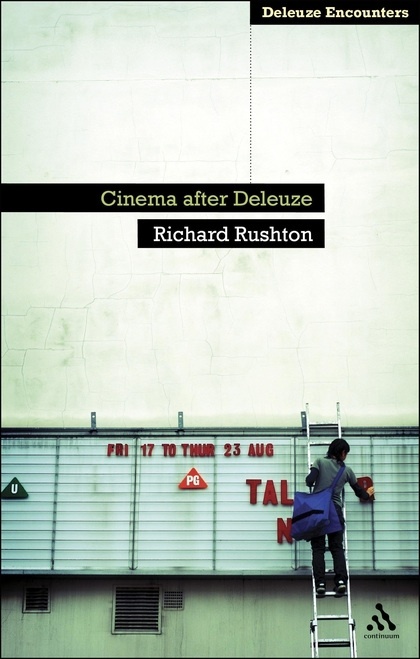 By focussing on actual cinematic examples in such detail, Rushton’s book is an undeniably engaging example of the application of certain the theories of Deleuze on cinema, especially the historic and narrative implications of the various types of image. The films discussed are illuminated originally in this manner. It may not be the ideal place to grasp the cinematic philosophy of Deleuze however. The diffuse approach of Rushton leaves the totality of the Cinema books’ vision merely implied, requiring the reader to work back via more taxonomic commentaries such as Felicity Colman’s recent Deleuze and Cinema: The Film Concepts (2011). Ultimately, its anecdotal and accessible style may filter the complexities of Deleuze at the cost of insights gained by engagement with its inherent difficulty.